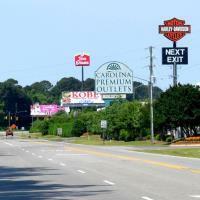 Effective August 1, 2014 Industrial Park Drive will be renamed Outlet Center Drive. Businesses affected by the name change will receive notices in the mail detailing information on street numbering and address change cards for the post office. The road's name will change in both Smithfield and Selma. Since the Chamber is located on Industrial Park Drive, our new street address will be 1115 Outlet Center Drive. Our mailing address will remain PO Box 467, Smithfield, NC 27577.